Sister Eddie B. (Bee-Bee) Crocker was born on August 28, 1930 to the late Eddie Robinson and Mary Brinson-Robinson. Eddie B. joined Philadelphia Baptist Church in Stewart County, Georgia under Reverend Brown, then later joined Mt. Zion Primitive Baptist Church of Stewart County, Georgia under the leadership of Elder Daniel, and continued her true faith as a primitive Baptist under Wonzie Gardner and Elder Louis Thomas. Eddie B. served as a mother of the church and the clerk until her death. Her clear heart and mind of God was still on the well-being of the church, the rules of the church. Eddie B. attended Stewart County Schools of Lumpkin, Georgia. The seed of her life was planted in Cuthbert, Georgia, and Stewart County, Georgia. She was joined in holy matrimony on June 6, 1948, before God to the Late Doc (DC) Crocker and to this union one son was born. The final call from God to be released from her earthly body was on May 18, 2018, at Patterson Hospital in Cuthbert, Georgia.Eddie B. was greeted at her heavenly home by her late husband, Doc (DC) Crocker, one Son, Gus Crocker, and a host of family and friends. 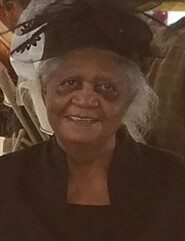 She leaves to cherish her memories: her grandchildren, Tanya (Glen) Gandy, Stephanie Crocker-Johnson, Takeysha Milsap, Teneka Brown, Gregory Starling, and Robert Milsap; greatgrandchildren, Teidra Gandy, Chasity Crocker, Brian (Theresa) Gandy, Key’Sean Garcia, Kai’Bian Ealy, Jayden Starling, Jyanna Strarling, and JaQuelia; one great-great-grandchild, Terrell Kai Gandy; sisters, Alvesta McGriff, Amie Dixon, and Frances Gadson; brother, Johnny Sam (Minnie) Robinson; a devoted daughter-in-law, Rosie Huff-Crocker; stepdaughter, Carrie (Lee) Chester; sisters-in-law, Lula Robinson, Irenen Beauford, and Joann Robinson; brothers-in-law, Frankie Walker and Marion (Mildred) Crocker; a special cousin and goddaughter, Alice Faye Brown; a nephew that was raised like her own son, Edward (Marva) Miller; and a host of family and friends.